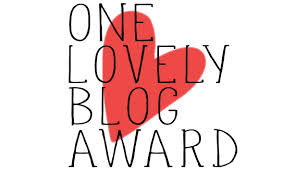 I’ve been nominated for the One Lovely Blogger Award by Melissa from The Hopeful Wayfarer! Her posts cover a range of topics, there’s something for everyone! I love her book reviews, as I scour blogs for ideas for my next books. And, DIY posts are my favorite, especially the ones where you learn something and can give very useful tips to your readers. Go check out her blog, you won’t be disappointed. (Also, you can find her One Lovely Blogger post here)! 1. My boyfriend is one of the sweetest, most kind, romantic people I know. He’s a police officer, and when he’s working he is the exact opposite. He’s uptight and serious. It makes me crack up because I get to see both sides of him and love knowing I get the nice side every day. 2. I was a tomboy growing up, but now I love fashion, and looking cute and having an outfit together for the day, knowing I look put together. 3. My parents once told me when I was in college that if I got a tattoo they wouldn’t pay their portion of my education that we had agreed upon. In the course of my undergraduate years I got 3. And I kept them all a secret for 3 years, and shortly after I graduated my mom discovered all of them. They still kept up their end of the deal. 4. I LOVE taking care of people, and being there for them. Since becoming an EMT I have slowly developed my career into a more caring, long term relationship with patients, working in the ICCU. The love and compassion that I feel every day for my patients leaves me with an amazing feeling that the end of the day. 6. I am a daddy’s girl. My dad is one of my best friends. I can talk to him about anything, he’s always there for advice, and help fixing anything. He’s my mechanic, my go-to, and I love him so much. 7. Growing up I was in 4-H. For those of you who don’t know, that means I was a farm kid, who raised animals/livestock, and used to show them at the fair. I had animals like cows, goats, sheep, chickens, rabbits, guinea pigs… And I pretty much showed all of them at the fair. I still have trophies and ribbons. Someday I’ll post awesome pictures. Thank you again to Melissa for nominating me, and I hope the bloggers I nominated will also post 7 facts about themselves for us to read!